Please refer to our stock # 11202 when inquiring. 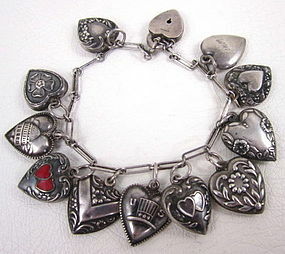 The lovely vintage bracelet measures 7" long and has 13 dangling puffy heart charms roughly measuring 5/8" long x 1/2" wide. There are a variety of designs on each heart including, US with uncle Sam hat, double hearts, double hearts with red enamel, the US capital building, and flowers. Some of the reverse sides are engraved with names including Dorre, Janet, Velma, Kathee, J.L, Alie, Faye, and Lenore. There is some light wear to the hearts, and one has a deep dent on the reverse. Overall, the bracelet is in very good condition.